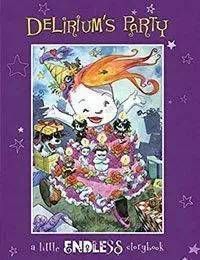 Award-winning writer and artist Jill Thompson returns to these kid-friendly versions of the characters from the bestselling SANDMAN series. Upset that her sister Despair is unhappy, Delirium throws her a party and invites her Endless siblings. Each sibling brings a gift that's unique to his/her/its realm in an effort to cheer up Despair. But what could possibly cheer up the anthropomorphic representation of hopelessness?